Box Office First Week Collection: Could Aamir Khan’s Dangal BEAT Salman Khan’s Sultan? Aamir Khan starrer Dangal is roaring high at the Box Office since day 1. The film, which is based on ex-wrestler Mahavir Singh Phogat and his two daughters Geeta and Babita Phogat, is receiving rave response across the country and overseas as well. Since its release, the film is unstoppable and breaking new record each day at the Box Office. On the other hand, Salman Khan’s Sultan had done an amazing business, courtesy to its advance bookings and Eid release. Because the movie released on a national holiday, it garnered more audiences at the screens. Dangal collected Rs. 29.15 crore (291 million) nett approx on its first day and witnessed an amazing weekend ahead. The film collected Rs 34 crore (340 million) nett approx on Saturday, Rs 41 crore (410 million) nett approx on Sunday, Rs 24.75 crore (247.5 million) nett approx on its first Monday, Rs 22.50 crore (225 million) nett approx on its first Tuesday and Rs 20.75 crore (207.5 million) nett approx on its first Wednesday. For the first time any Bollywood film has grossed over Rs 20 crore each day during the weekdays and it’s quite commendable. 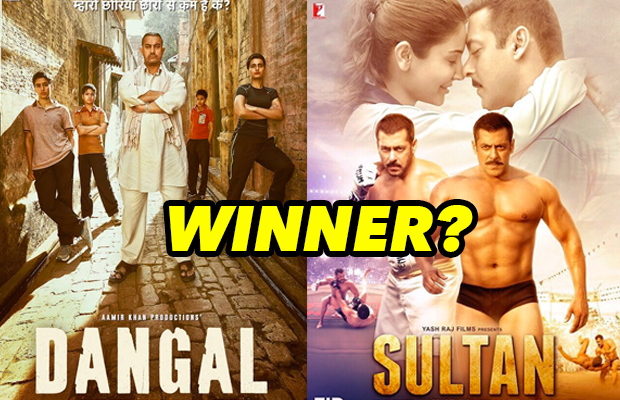 But could Aamir Khan’s film beat Salman Khan’s Sultan in it’s first week? Being wrestling a common factor between both films, everyone is quite gripped and waiting to know if the film could break Sultan’s record or no. CLICK NEXT TO KNOW! Dangal has collected Rs 19.75 crore (197.5 million) nett approx on its first Thursday, taking the total first-week collection to Rs. 192.42 crore (1.92 billion) approx. The total one-week collection of ‘Sultan’ was Rs.208.59 crore net approx. Going by the Box Office collections of this film, Aamir Khan has proved to be a popular star than Salman Khan and Shah Rukh Khan in some of the regions of the country. The film has set three first week circuit records in East Punjab, Mysore and Tamil Nadu / Kerala. The coming two days will decide where Dangal is leading ahead. Dangal is based on the life of ace wrestler Mahavir Singh Phogat and the journey of his daughters Geeta and Babita Phogat. The film is mainly based on wrestling and on how a father leaves no stone unturned to craft his daughters to become wrestlers at an International level. Previous articleDon’t Miss: This Never Seen Before Promotional Strategy Of Shah Rukh Khan’s Raees! Next articleBigg Boss 10: Guess Which Evicted Contestant Will Enter The House Again On New Year!